Over 200 pounds of beans were cooked at the Rio Grande Civil War Memorial Bean Dinner with a word by President of Rio Grande and Rio Grande Community College Dr. Michelle Johnston. Pastor Vinton Rankin gave the invocation. Cadot-Blessing Camp 126 displayed Civil War memorabilia and provided a rifle demonstration along with an encampment set-up. Modern and Civil War era music was led by Jenny Dyer Henchey. VFW Post 4464, supported by Cadot-Blessing, raised the colors. Area historian C. Robert Leith lectured on the history of the 147th Rio Bean Dinner. Veterans in attendance are listed as follows. Back row, from left to right, Gene Parsons-Army, Bill McCoy-Air Force, Larry Davison Army, Doris Davison Army, Michael Putnam Air Force, Lowen Saunders Navy, Bruce Gabriel Army, Randy Skaggs Marines, Jim Skaggs Army, Bob Nibert Army, Joe Clark Army, Bill Hatcher Army, Bud Crothers Army, and Patrick Stout Air Force. 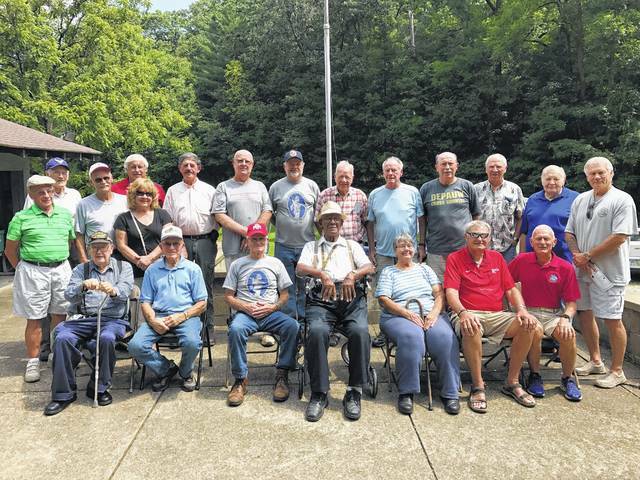 Front row, from left to right, Donald Wright Army, Bill Merry Army, Mickey Morgan Army, Bill Jackson Navy, Dorothy Turpak Army, Art Lanham Navy and Greg Ervin Army.